Anyone who has sent a child to college – or who is in the process of helping their child choose where to go to college – knows the process is full of emotions and tension. It’s great when both parent and child are on the same page and in agreement. However, sometimes there are differences of opinion as to what’s best. So what happens when your child chooses a college that you don’t think is the right fit? How do you cope with your child’s college choice when you think it’s the wrong one? It’s important to remember that the choice of a college is about your child’s needs – not yours. While it is important to keep in mind factors such as cost of attendance, the financial aid package and scholarships offered, and living arrangements, the goal is for your child to get a quality education in the major they’re interested in (and hopefully one that will be in demand when they graduate and allow them to be self-supporting!). What is your child interested in? Has he/she chosen a major? How much does this particular college cost? Is financial aid available? Does your child qualify for any scholarships? Believe it or not, costs vary from school to school and finances do play a part. College is a financial investment in your child’s future. What type of living arrangements are you considering? Will your child live in a dorm or an apartment? Have you visited the campus and dorms in order to get a feel for what would be a good fit for your child? How will your child do with a roommate he’s never met before? How far away is the college? Have you discussed and agreed upon frequency of visits or how holidays will be handled if the college is too far away? Have you looked into what other living arrangements are available should the time come when dorm life is no longer appropriate or desirable? But what happens when your child ends up selecting a college that you (his wise parent) didn’t like? What then? Do you forbid your child to attend? Do you refuse to offer any financial support? Do you capitulate and let your child make this decision on his own despite your best input? What do you do when your child chooses a college you don’t like? I’ve been in this situation and let me tell you, it’s a hard pill to swallow. There is no guide book and if you ask ten different parents for advice, you’ll get ten different answers. Because here’s the thing – every child, and every child-parent relationship, is different. What works in one family isn’t necessarily what will work for yours. While one child will accept ‘no’ for answer, another won’t (this is my child, by the way). And it’s easy to fall into the trap of ‘I’m a bad parent’ when your child doesn’t take your advice – trust me. But choosing a college is a bit like choosing a spouse: no matter how much input we parents think we deserve, the ultimate choice needs to rest with the child who is now a young adult. We’ve raised them to (hopefully) be independent and make their own decisions. And it stings when they make a decision that doesn’t line up with our wishes. So my advice is this – try to remove your own ego and needs from the equation as much as possible, try to ignore the voices of other parents telling that you ‘need to put your foot down’, and try to support your child in what is one of the biggest decisions they’ll ever make. Even if it turns out that this IS the wrong choice, they’ll learn from it. And who knows, your input might be more valuable the next time advice is sought. It’s not all about you. I know, this one is tough. You feel like you know what’s best for your child and you only have their best interests at heart. But sometimes we have to let our child make their own decisions whether we like them or not. Try to find out what about this college appeals to your child. Discovering why they want to attend this particular school may open your eyes to interests and/or needs your child has that you may have been unaware of. At the very least you’ll gain an understanding of your child’s decision-making process. Talk about the pros and cons of the choice. You’re still involved and nothing says you have to rubber stamp every decision without at least weighing in and offering your perspective as well. This is the time for you and your child to talk together like adults and try to reach an understanding even if it’s not complete agreement. Once the decision has been made, support your child. Recognize what a huge step this is and enjoy their excitement. Don’t squelch their enthusiasm simply because you don’t love where they’re going to school – unless you want to make further communication more complicated. Whatever the outcome, you want your child to know that they can talk to you and that they won’t get recriminations with every conversation – nothing is a bigger impediment to your relationship. One of the hardest things we parents have to do is let go. But this is a test of how well your child is going to launch out into the ‘real world’. Whether they sink or swim is scary for them, and it’s terrifying for you as their parent. But if you can remember that you’re still on the shore and you’ve got a life preserver to toss out should they need it, the experience is a little less frightening. Notice that I said ‘a little’ – the truth is that you’re still going to be scared. But with support, communication, and understanding, you may find out that your child picked a school that met his needs after all. Be sure to check out these must have college items so that you don’t forget something they’ll need in case of an emergency. And if your child is skipping the dorm experience you’re probably wondering how you’re going to feel when you move your child into their first apartment. Finally, my friends over at YaYas2cents have a great post in case you’re wondering how you’re going to help your child pay for college. Here are some resources that may help you and your child deal with these decisions and to survive this difficult period in their lives. The 6 Most Important Decisions You’ll You’ll Ever Make: A Guide for Teens (updated for the digital age) by Steven Covey. Update as of Spring 2018: Now that Butterfly is about to finish her junior year in college, I have to admit that she’s thriving, happy, loving school, and on track to graduate despite a change in major. 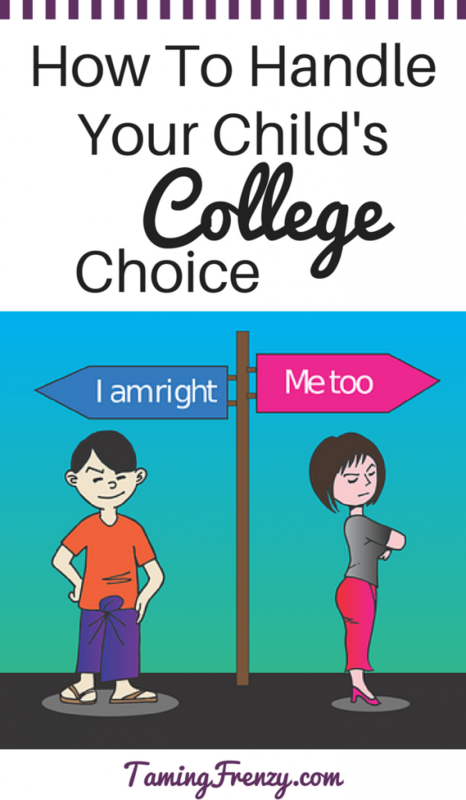 I didn’t love her college choice – okay, I was REALLY opposed to her choice – but in retrospect, I think she made the choice that was right for her. She’s happy, healthy, works 2 jobs and has a good GPA (much better than mine was!). Sometimes it’s hard to admit that a mom doesn’t always know best. However, it is good to know that you’ve raised a child who is capable of making good decisions – even without your approval. Has anyone else been through a similar experience? This article amd comments saved my sanity on April 30 when my son is about to commit to a school I dont have a good feeling about. Thank you everyone for sharing your thoughts – definitely the hardest challenge I’ve experienced as a parent so far. It doesnt help that my first child chose a school I felt was such a wonderful place. Trying to let go and trust in my son’s journey of self discovery. Perhaps it is a deep fear of failure – probably my own baggage that needs to be kept in check. Thanks again! Sarah – I wish I could give you a hug right now! It’s SOOOO hard to sit back when they pick a college you’re unhappy with! I was a very unhappy camper when my daughter selected the college she’s attending and it was really hard for this “wants to control the universe” mom to sit by and just watch it happen. I will say that she’s on track to graduate next May and it’s turned out to be a great experience for her. And it’s taught me that maybe the universe doesn’t need me to try to control it (even though I think it does!). Thinking of you and sending you virtual hugs and support. Please touch base and let us know how it goes and how you’re doing! I did not go through this my children and I am sure it was not easy for you. Letting go of control with them is never easy. especially when we know we are right? lol! They seem to make it through just fine despite what we think. I have to admit that I would love nothing more than to be in control of the universe – especially as it relates to my kids. Asking myself if I’d been serious when I raised them to think for themselves was a bit sobering. It’s so easy to assume they’ll grow up and adopt our attitudes and opinions. Certainly caused me to do some serious self-examination but that’s a good thing. THis wasn’t an issue for us. BUT it sure would have been hard if it was! You are wise. Every child, every family, every financial situation is different. And although it’s good to have friends to talk to and get their perspective, no solution is one size fits all! It was certainly an eye-opening experience for me because there was a lot of judgment – and I was as guilty of wanting to adhere to norms and expectations as anyone else. Sometimes you’ve just got to let it go and let someone else decide what’s right for them which was a really hard mommy-lesson for me to learn! Hey Shelley, This is a great article and I’m sure emotional to write it! I’ve worked with high school kids trying to help them make a choice that is based on all the factors, not just what football games they want to go to. Your words will help many parents. I will add this to the college planning resource list on my blog! Pinning. Hi Lisa! I’d love to say that I just coped like a trouper with our daughter’s choice, but it would be a lie. It was very hard because I felt like I knew what was best and to take the step back and let her make the decision I didn’t like was really tough. Fortunately, my hubby is sometimes much, much smarter than I am when it comes to our kids. I hope the lessons I had to learn will help someone else. Thanks so much for visiting and for pinning – I truly appreciate it. Big decisions Shelley! Thanks for sharing with us at #overthemoon link party I’ve pinned and shared. I have to admit that I can’t even imagine how hard it was to watch your son go that far away! Wow! My daughter is already talking about moving someplace far away when she graduates and while I understand her reasons and agree with them, it’s hard to imagine her so far away. My hat is off to you for being one awesome mom! Happy Mother’s Day to you, Michelle. Great tips! I’m a decade away but dreading it all the same. There is this urge where, since I’ve reoriented my life to ensure at least most of their tuition will be paid for, I should have a say. There is also knowing that if they don’t feel like they have a choice in the matter, they could hate their experience even if it’s the best choice for them on paper. I understand your feeling, JT. It was the same for me – I felt like I should have a humongous say in it since I was getting to help foot the bill. I can honestly say that stepping back was the hardest parenting test I’ve had so far. Thanks for stopping by. I know that when my kiddos go, I’ll bite my tongue and support them as best I can. There will be no doubting tones in my voice. At least, not out loud, to them. Hi Jenn! I’ll admit that this was REALLY hard for me! I talked myself blue in the face and it was hard to finally sit back and let my daughter make the decision. The one thing that did help was remembering advice I took from other people that turned out not to be good for ME even though others thought it was. Some lessons are hard learned and then hard to implement. I have to admit that it was really hard for me when my daughter picked the college that I was not happy about so this was a lesson I had to learn myself. Now that she’s in her second year, I can see how she’s blossomed and matured and that it was the right place for her. I still don’t love that she’s in a place I don’t enjoy visiting, but I always look forward to seeing HER. So I just bite my tongue, ignore the surroundings, and give her a big hug. Parenthood is so hard sometimes!